This entry was posted in Ab on Youtube on September 23, 2013 by ab. The corporate world, which clearly runs the governments of the world in cooperation with the intelligence world, has a firm fascination with occult numerology. Under the deal, a Fairfax-led consortium would buy the embattled smartphone maker for $9 (U.S.) a share, above the price before a halt today but well below where the shares stood before they began to melt down on Friday, when the company unveiled a massive second-quarter loss. 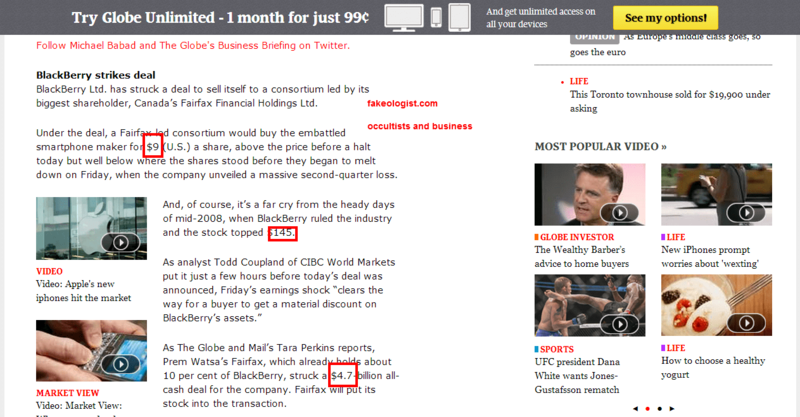 via You can open your eyes now: BlackBerry has a $9-a-share takeover deal – The Globe and Mail. This entry was posted in Corporatism, Magic numbers on September 23, 2013 by ab. 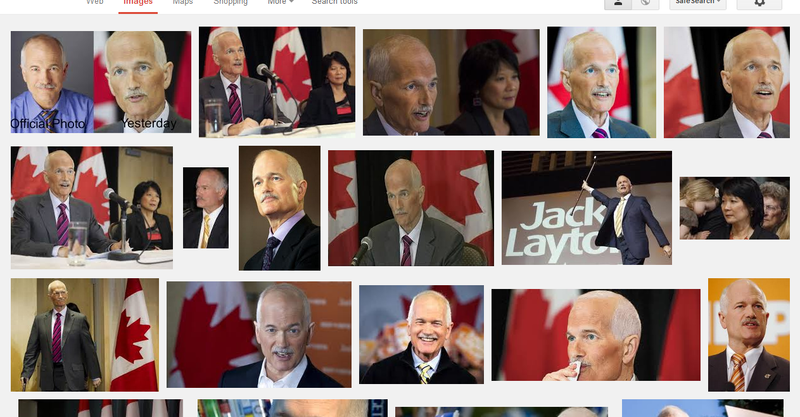 jack layton sick – Google Search. As I discuss Jobs and the potential for some sort of psyOpery in his death, I often wondered about the parallels to a populist politician here in Canada, Jack Layton who died on 8/22/11. Jack was a popular leader on the left, one who was quite possibly poised to become PM. While I am quite convinced now that the political arena is pre-planned and pre-arranged, one must wonder what the potential for fakery is in this situation. What if in fact Jack Layton did not get sick, but was told that his role in the political drama was to rise to power, get the people and their hopes up, and then to exit the stage in a dramatic fashion? Is there much difference in getting a devastating cancer and starving yourself? Would it be beneath someone who we are told has such respect for the “working man” that he would be put before us or co-opted later, all in the name of political theater? These are questions only a fakeologist would ask. All respect to the Layton family if in fact he left this planet as we are told. You must be aware that 9/11 forces us to ask these questions. We did not ask for 9/11. We did not ask to be deceived. This entry was posted in Magic numbers, Political Theater and tagged jack layton death hoax, layton death hoax, populist leaders death hoax on September 23, 2013 by ab. What happened to Steve Jobs? No doubt the story we are told had problems. But why? Didn’t we see him walking around in the (lack of) flesh? 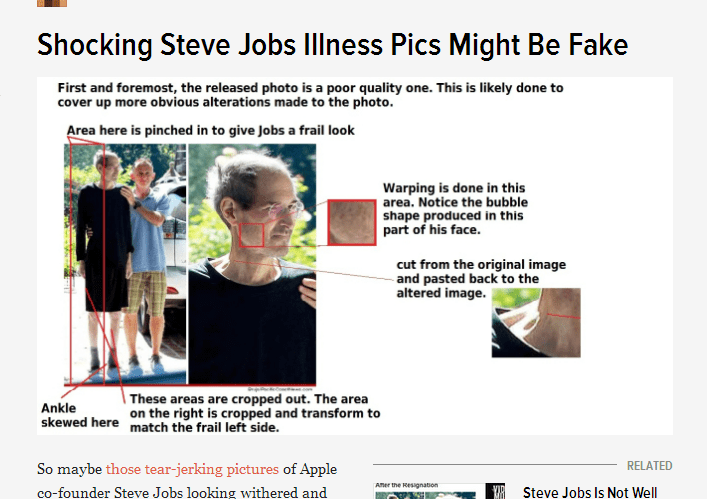 via Shocking Steve Jobs Illness Pics Might Be Fake. This entry was posted in Corporatism, Suspicious media events on September 23, 2013 by ab. I do think PsyOp-era is a good term for the constant, ongoing, incessant psyOp show going on globally. I always though soap operas were for females. I have 0 interest in who’s doing what to whom on TV, except when it costs me money. The whole point of the global psyoperas is to cost you money. Whether it is more security at the airports or your local child-mill (school), you pay for it via taxes, bigtime. Therefore, since the pre-fab imagery is global now, they must make it for a global audience. That’s why you will have simulated victims from every country. You have bought and paid for politicians in every country, singing from the same songbook, too. We have John Baird, who is screaming daily about terrorism. He is the antithesis of all things Canadian. He is a paid shill that makes me cringe every time he opens his mouth, since no Canadian stands anything he says. I suspect that the average American, especially those that know how they’re being played for fools, does NOT support the anti-human (or anti-Muslim) war activity either. The global terror scam is global. It’s no different from the globalization of corporatism. It’s a formula and it’s ramping up weekly. Four explosions and more gunfire have been heard from a mall in Nairobi where Kenyan troops and al-Qaeda-linked militants are battling today over hostages taken in the weekend terror attack that has killed at least 62 people, including two Canadians. via Kenya mall crisis: More blasts, gunfire heard – World – CBC News. This entry was posted in Psyops and tagged kenya mall shooting on September 23, 2013 by ab. via BUS CRASH CANADA – YouTube. Thanks for the mentions, Jungle. This entry was posted in Recommendations, Video on September 23, 2013 by ab.